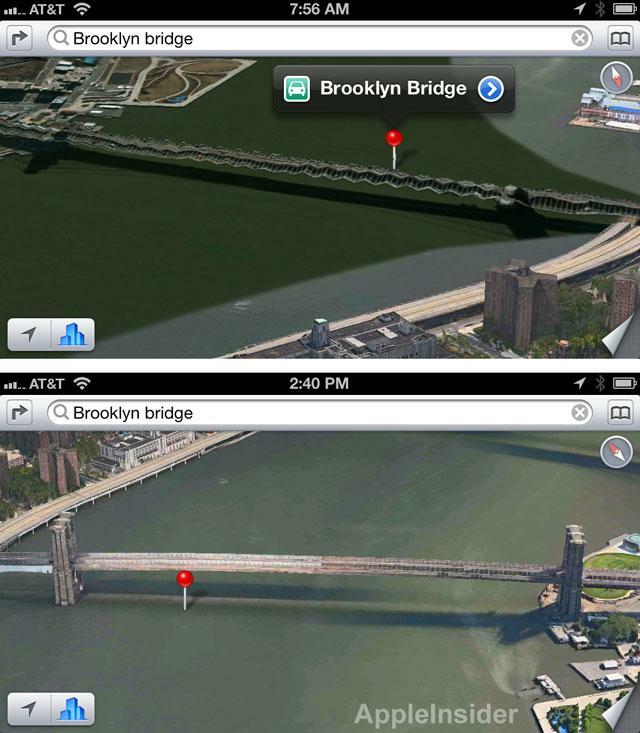 Left, the old view of the Brooklyn Bridge in iOS 6 Maps. Right, an updated render. In one example highlighted to AppleInsider by reader Sal, the Brooklyn Bridge in New York City is now accurately rendered in three dimensions. Previously, the bridge shown in a distorted fashion. The Flyover improvements were not immediately available to all users, as some devices were still shown the older data. For example, one reader said updated images were appearing on their iPhone, but not their iPad. The behind-the-scenes improvements being made by Apple come after its new mapping application in iOS 6 has received considerable criticism for being inferior to Google Maps, which previously provided mapping data for Apple's iOS devices. Apple Chief Executive Tim Cook even publicly apologized to customers for the quality of the Maps application in iOS 6 in a statement issued last month. He also vowed that the company was "doing everything we can to make Maps better." 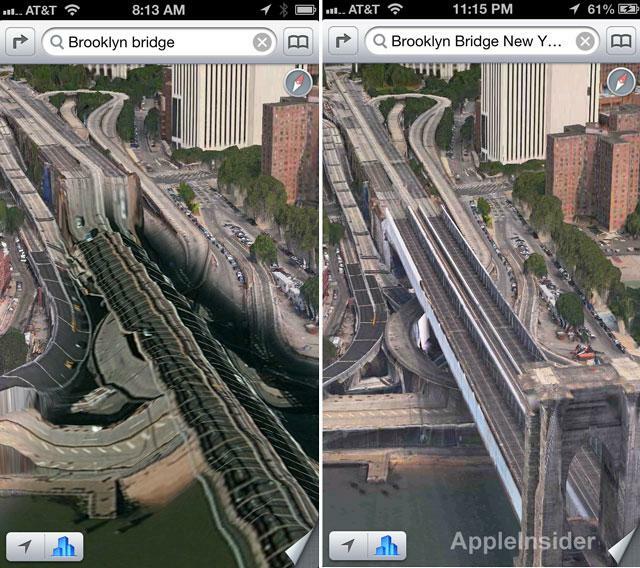 Top, the Brooklyn Bridge was previously distorted in iOS 6 Maps. Bottom, it has been updated. 3D Flyovers are one of the hallmark features of Apple's iOS 6 Maps, combining overhead images with three-dimensional geometry to allow users to view and interact with major cities in new and unique ways. But the 3D mapping data also has considerable flaws that led to distorted views of major landmarks like the Brooklyn Bridge, Statue of Liberty, Hoover Dam and other sites. As Apple has caught flak for iOS 6 Maps, Google has not sat by idly. The company recently introduced new satellite imagery taken at a 45-degree angle to better compete with Flyover, while Google also made its popular Street View feature available in the Safari Web browser on iPhone and iPad. Google is also said to be working on a standalone Google Maps application that would be made available for download in the iOS App Store. However, that software is not expected to arrive until later this year at the earliest.